Being on the Atlantic coast, it’s no surprise South Carolina has access to some of the best oysters you’ve ever tasted. This state is brimming with fabulous oyster bars and seafood restaurants that serve high-quality oysters that taste like they just came off the boat. Whether you like ‘em raw or deep-fried, steamed or roasted, you won’t be disappointed with a trip to one of these 10 best oyster places in South Carolina. This place has a lot going for it, and its historic setting in a former cigar factory is just the beginning. Their oysters are the next best thing to being hand selected, with quality emphasized all the way from ocean to table. They’re served alongside a variety of vegan and non-seafood options to satisfy any diet. Plus, their on-site seafood market gives you access to the same fish, oysters, wines, sauces, and other ingredients they use on-site to cook your own delicious meal at home. With three locations in South Carolina, you have three times the reasons to stop by. Their raw bar is well known throughout the state as being one of the best, offering oysters on the half shell, hard-shelled clams, peel and eat shrimp, and even their famous oyster cocktail. You’ll also want to check out their happy hour menu that provides specials on food and drinks alike. From oyster apps and entrees to oyster cocktails and beyond, you can get your fill almost any way you like. Choose from steamed, chargrilled, fried, or on the half shell, or combine a few oysters with other seafood favorites in your very own sampler. If you’re a big fan of oysters, you’ll want to save room for a Shucktini cocktail that comes with an olive-and-oysters skewer. 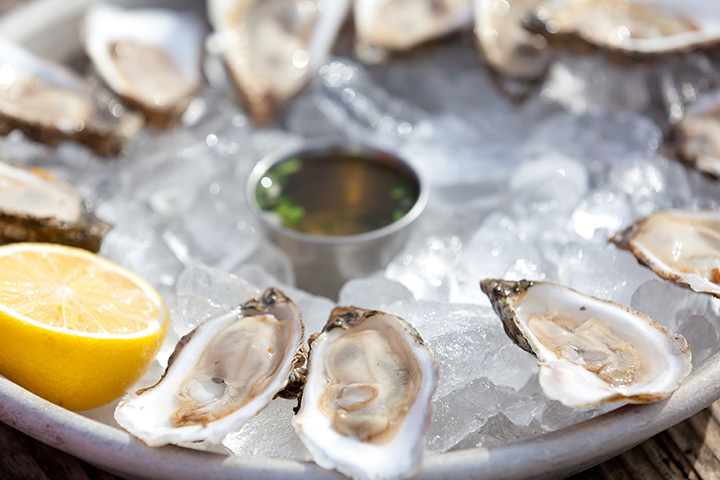 It just doesn’t get any better than waterfront dining and the best oysters on the island. This family-favorite eatery opened up on the site of an old oyster canning factory (how fitting!). The oysters here are as fresh as they come, with options like the oyster Caesar salad, a seafood medley, and varieties of oven-baked oysters to sate your cravings. There’s a whole lot more to their menu than oysters, but you’ll want to give their namesake specialty top priority. Known by locals for their 50-cent oysters, they make it easy to get a great seafood meal that’s delicious and budget-friendly. Their beachy vibe is like a quick trip to the coast, so every minute you spend there can feel like you’re on vacation time. This charming little oyster bar is the heaping helping of southern hospitality and top-notch seafood all rolled into one. Classy and sophisticated, you can take your choice of three varieties of baked oysters, or opt for the raw bar for even more variety. They also serve up a killer brunch that’s simple, yet savory. This place combines some of the best oysters in the Upstate with a full sushi bar to create a concept that can only be described as perfect. Despite being so far inland, the seafood is super fresh just like you’d expect at a coastal seafood restaurant. Prices are fair, portions are filling, and the flavors and variety of oysters just can’t be beat. Situated on Myrtle Beach’s boardwalk, you can expect sweeping ocean views while you enjoy your fresh catch. Aside from their top-notch oysters, they’re also known as mixing pot of wings, po’boys, burgers, steaks, and probably whatever you’re craving. Their happy hour specials are some of the best of the beach, with major discounts on food and cocktails alike. This tasty little raw bar is heavy on the oysters, blue crabs, and shrimp, but it doesn’t end there. Oysters Rockefeller, a fried oyster po’boy, and a steampot mix are just a few of options you’ll want to savor. Portions here can be quite large, so make sure to bring an appetite to match! Upscale and serene, this Upstate eatery is more along the lines of the oyster houses you’d find along the coast. Their oyster offerings include just about any way you like, and then some: get ‘em raw or steamed, Rockefeller, broiled and breaded, southern deep fried, or dripping in buffalo sauce and bleu cheese. If you’re feeling brave, grab an oyster shooter from the bar for a one-of-a-kind shot.